Sixty year old Lance Ferris died on Sunday the 14th of October, 2007 at Lismore base Hospital after suffering a stroke on Saturday. Lance Ferris from Australian Seabird Rescue collects dead birds from the beach areas of Evans Head. It is thought the birds died from botulism after eating dead fish. The man many of us fondly knew as the “Pelican Man” has passed away leaving a massive whole in the community. Sixty year old Lance Ferris died on Sunday the 14th of October, 2007 at Lismore base Hospital after suffering a stroke on Saturday. Lance dedicated his life to the rescue, rehabilitation and preservation of seabirds, turtles, and in particular the magnificent pelican and it was through his many years as a dedicated volunteer, using his own money and whatever donations he could find that Australian Seabird Rescue (ASR) came into existence in Ballina, New South Wales in 1992. After surveying other estuaries, Lance Ferris realised that what was needed was a huge education program campaign and the passion began. Since that time, ASR volunteers have been involved in the rescue and rehabilitation of seabirds and shorebirds, marine turtles and to date, have rescued over 1000 Australian Pelicans. Lance Ferris never lost his passion the rescuing injured seabirds. “I would like to absolutely commend the staff at Lismore base Hospital who worked so hard with Lance. It was a very upsetting time for everybody because everybody knew who he was and knew how hard he’d worked to save so many lives and yet there was nothing we could do to save this most important life,” says Marney Bonner. 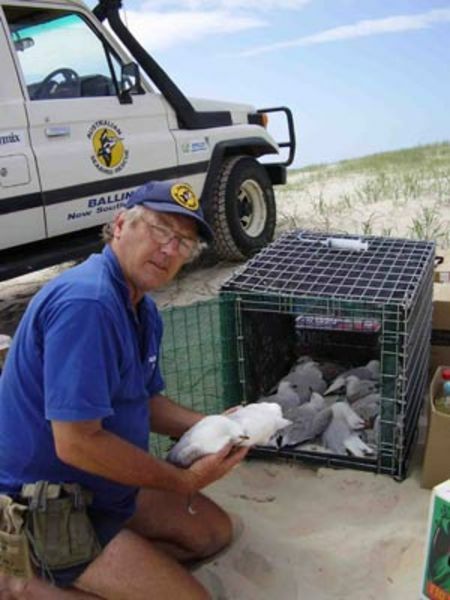 In 2004 as president of Australian Seabird Rescue, Lance led the volunteer organisation to win the inaugural National Coastcare Community award. In an earlier life Lance worked a police officer based in Casino and was a member of APEX. He also worked as a teachers aid for children with disabilities, was a well respected musician and a member of the Sonset Orchestra and could be found at any given weekend at the Lismore Car Boot Markets. Ballina Mayor, Phillip Silver says the death of Lance Ferris is a huge loss for the community. “I guess in many ways he was ahead of his time in terms of the recognition of that vulnerability of the environment and the water animals. Because he was doing it 20 years ago when it was certainly happening but people weren’t thinking about it,” said mayor Silver. ASR is always looking for more volunteers and as Marny Booner says “the pelicans have lost their best friend, if pelicans could cry, there would be a wailing around the nation that could not be ignored. It will take an army of volunteers to replace Lance Ferris”. Jason Ferris believes his Dad would never really let on if he was feeling unwell. “My Dad’s always run pretty close to the edge. Dad lived and breathed seabird rescue 24/7. I would often find him sleeping in all sorts of places in the back cars, on seats… his focus was never on his own health, more on the animals in care,” said Jason. A passion that Jason and Lance shared was music. “I developed an interest in music as a result of Dad. Dad was really an amazing musician and beautiful singer. In my 20’s he and I started playing music together around the North Coast. Definitely some of my most treasured memories of Dad,” said Jason. As much as it can be…it will be business as usual for Australian Seabird Rescue. A public memorial service will be held for Lance Ferris. Marny Bonner wrote this in the ABC North Coast guestbook. 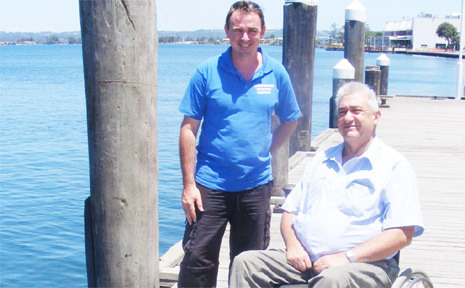 LANCE FERRIS WHARF: Ballina’s mayor, Cr Phillip Silver, (right) with acting general manager of Australian Seabird Rescue, Keith Williams, announcing the naming of the wharf at Fawcett Park as the Lance Ferris Wharf. 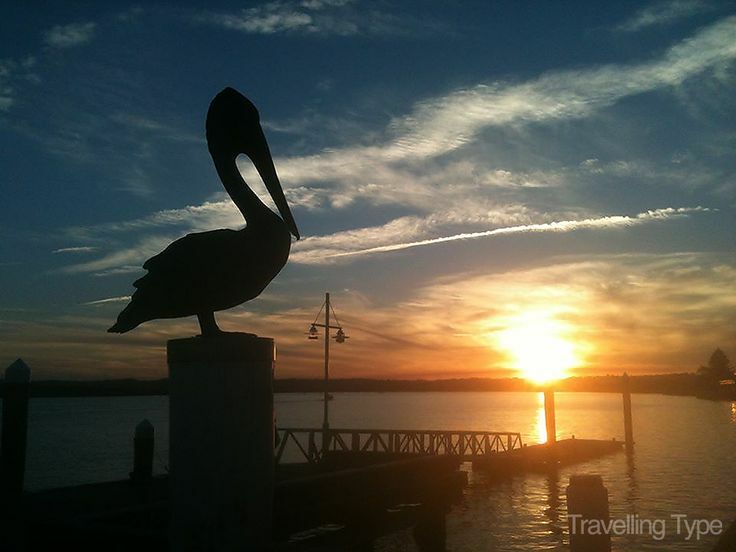 The wharf at Fawcett Park is now the Lance Ferris Wharf, named after the late Lance Ferris – the Pelican Man – who founded Ballina-based organisation Australian Seabird Rescue. And work is currently being undertaken on the design for a statue of a bronze pelican to be perched on the jetty in Ballina’s CBD. Ballina’s mayor, Cr Phillip Silver, was due to make the official announcement on the naming of the wharf at the inaugural Lance Ferris Memorial Dinner scheduled for December 12. But with last week’s decision by Australian Seabird Rescue to postpone the dinner, the announcement was made early. He said council wanted to recognise the work of Mr Ferris, who died in October 2007, aged 60. After Mr Ferris’ death, council resolved to rename Fawcett Park as Lance Ferris Park. But that move was knocked back by the NSW Geographical Names Board following objections. There won’t be any problem with the naming of the wharf, Cr Silver said, as it is a piece of council-owned infrastructure. Keith Williams, acting general manager of ASR and partner of Mr Ferris’ daughter, Rochelle Ferris, welcomed the decision to name the wharf after Lance. He said the move not only acknowledged the work of Mr Ferris but also the Richmond River which Mr Ferris was so passionate about. “This is a fantastic,” he said on behalf of the family and the broader family of ASR volunteers. He is the father of Finn, Lance’s grandson, who was born just over a month ago. Mr Williams said he enjoys taking Finn to the wharf. “This (naming the wharf) is to say ‘your granddad was someone really special’. And much of the respect (for Lance) comes from the community – you can’t manufacture that,” he said. A local artist has been commissioned to create the life-size bronze statue of a pelican which will be installed on the wharf early next year. Cr Silver said the council had budgeted $10,000 for the statue, which had come from the staff operational budget. He said he hoped the pelican would become an icon for Ballina now that nothing stood in the way of the demolition of the Big Prawn at the southern entrance to the town. “Whether it (the pelican statute) evolves to be an icon of the town is a function of the community,” he said. Cr Silver has already suggested Ballina could rebrand itself, replacing the seahorse, so the shire can be Ballina bypass-ready. Work on the new highway route is expected to be finished by 2012. He said a rebranding of the shire wouldn’t be expensive, as things like stationery stocks would be used up in time. Meanwhile, the Lance Ferris Memorial Dinner will be held on June 5 next year, World Environment Day. Mr Williams said anybody who had purchased a ticket would receive a full refund. A recent unveiling on 24th September of Frank Miles life-size bronze pelican “Steptoe”, (pictured left) commissioned by the Ballina Shire Council, at the Fawcett Park Wharf. This wharf was renamed on the day to the “Lance Ferris Wharf” in honour of the late Lance Ferris the towns’ famed ‘Pelican Man’. This was a very exciting moment for Frank as well the Australian Seabird Rescue Service and Lance’s family members. If there’s one Australian bird that we’ve all watched with awe it’s the pelican. But as we’ve admired this bird we are mostly oblivious to the tragedy that the nation’s most popular hobby, fishing, is visiting upon our feathered friends. Accidental hooking by recreational fishing, discarded hooks and fishing line have become the birds’ most lethal enemy. Bills, legs and wings are being hooked or entangled. The result, all too often, is a painful death. Tonight’s Australian Story is about one man, a Ballina based former police officer called Lance Ferris, who’s dedicated his life to fixing the plight of the pelicans. With spectacular physical agility, he “bribes” the pelicans with fish and then dives to catch injured animals so they can be treated and saved. Over the past 12 years, often living well below the poverty line, he has rescued and rehabilitated hundreds of birds and conducted educational workshops in schools and fishing clubs up and down Australia’s east coast. Featuring stunning wildlife images, Australian Story retraces the rough, tough and exciting life of Lance Ferris. We see first hand his unconventional but effective pelican catching methods and the extent of this problem along with the solutions he has employed. Browse comments posted to the online forum that followed A Bird in the Hand. REX HUNT: Hello. I’m Rex Hunt. Tonight’s Australian Story is about a man who has dedicated his life to solving the problems sometimes unwittingly created by us anglers. He is Lance Ferris – known as ‘The Pelican Man’ for his incredible work in saving these magnificent birds from terrible injuries. And his efforts are changing attitudes on the water. This is Lance’s story. EVAN KOSACK – VET:Lance and the fishermen in the area started out being at loggerheads a little bit. LANCE FERRIS: I don’t think they believed that the problem was as bad as it was. Pelicans torn to pieces, basically, by fishing tackle. EVAN KOSACK – VET: Lance was telling people, basically, that their beloved hobby was causing a lot of damage and that they were acting irresponsibly. Lance is not the norm. ANTHONY MUYT: He’s very independent, he’s very focused, he thinks outside of the square. He’s a bit of a mad scientist. He was just some joker who rolled up and was jumping off boats into pelicans. They thought he was nuts at first – thought he was a madman. He is extremely professional. He likes perfection. He’ll work at something until he has it. DEBBI DEVINE – SAM’S MUM :I look at him sometimes and I think, “Wow. This grown man – the way he is with these animals.” It’s amazing. It’s like they’re his children. MARNY BONNER: There are many, many people that would go, “Oh, gee. “Gee, fancy seeing two pelicans in one day, you know, “both with hook injuries,” and continue about their business. But the interesting thing is that it engaged Lance’s curiosity such that he went out and searched to see if there was an even bigger problem. LANCE FERRIS: That led us into going out on the island to see if there were other pelicans out there. 108 birds on the island, there were, with 37 tangled up in fishing line on our first visit. MARNY BONNER: For Lance, standing there with binoculars in hand observing bird after bird after bird coming into his vision with crippling, cruel injuries would be very overwhelming. LANCE FERRIS: I was in shock and horror. I couldn’t believe how bad the situation was. I went back to the boat and cried for half an hour. I just couldn’t believe… I’m no bronze Anzac hero. I might have been in the police force, but that doesn’t mean to say you don’t get cut up when you see so much damage. There were some with amputated wings and gangrene in their legs. It was a horrible thing. Being a wildlife carer for some years, at that stage, I was just amazed that I wasn’t aware of it and nor had it been brought to our attention by any member of the public or any other wildlife people. ROCHELLE FERRIS: He was so devastated by that, but he was also looking at the bigger picture, and he sat back and thought, “You know, how many estuaries are there in Australia “that are so populated by humans? “And I’m only looking at this one.” And the problem just blew out in his head. MARNY BONNER: Lance fell asleep that night surrounded by crippled and injured birds and woke up and he was still surrounded by crippled and injured birds, and was compelled to do something – to start action right there and then. LANCE FERRIS: It was three months and I had that 37, but as I was getting that 37, more became entangled as I went. ROCHELLE FERRIS: The focus on getting out there and attending to all these sick pelicans really did take over his life. MARNY BONNER: That was the dawning of the obsession and the birth of Australian Seabird Rescue. LANCE FERRIS: I didn’t really think about it changing my life at that time. MARNY: In the early days, some of these injuries were quite old. They had had longstanding chronic injuries and they did require a lot of treatment. And to his amazement, the local vets were extremely interested and extremely supportive. LANCE FERRIS: I had to look closely at the pelicans to see a line trailing under a wing, or a hook somewhere. MARNY BONNER: Because it’s difficult to see injuries on pelicans, people don’t notice. I believe pelicans don’t look sick when they are injured. Pelicans can’t cry. LANCE FERRIS: Everybody believed that the hook would rust away in two or three days. We’ve done some tests on all different sorts of hooks and it’s at least six months before the hooks rusted away. So there were lots of things that make people not sort of bother. ROCHELLE FERRIS: He was so concerned and frustrated by the lack of interest from the community that these birds were just all being tangled and no-one seemed to care. LANCE FERRIS: But it’s not all bad out there. There are some people who really have the right concept. If the bird’s quiet and fairly well under control, we give everyone that opportunity to, say, pat a pelican or to have a close contact with it. MARNY BONNER: Lance experienced quite a lot of loneliness in his childhood. He didn’t have a lot of affection in it. He is essentially a shy person and a bit of a loner. LANCE FERRIS: I can remember vividly as a boy, after I’d found a little frog with a broken leg, I think we taped it up with a matchstick, and for the life of me I can’t remember whether it survived or not. MARNY BONNER: That’s what I saw in Lance when I first met him, was this uncanny ability to really spend a lot of time thinking about how he could improve life generally for a particularly severely disabled child. Lance had his fairly demanding job of teacher’s aide with disabled children. The realisation of the enormity of the problem on Pelican Island did change Lance’s life, but I don’t think he was conscious of that at that time. He was merely solving the problem on the day. LANCE FERRIS: But then there were cutbacks with the school and then came the word that said, There’s no more work. I’m sorry, we have to put you off. There’s no more funding. We don’t have enough children. And I had to drive away from the place. And I…I won’t forget that day. I wept all the way home. I was at a little cattle dairy, a converted place. The very next day the landlord drove down the paddock and I went up and I said, “About the rent…” He said, Oh, yeah. He said, I was gonna tell you about that. He said, I really like what you’re doing with the pelicans and things. That’s fantastic, that’s a really good thing. And he said, And you’ve rescued my cattle out of the bogs here from time to time, “and I’ve decided not to charge rent anymore. Oh. You know, sort of looking around waiting for lightning to strike and pinching myself to see if I was awake. I was just ecstatic. MARNY BONNER: Days rolled into weeks, and weeks rolled into months, and he was spending more and more time doing everything he possibly could to catch all the birds. And so it just became increasingly consuming of his time and his resources – all his resources. So it became a situation for Lance where if there was a choice of providing food for himself or getting fish to catch an injured pelican, the fish for catching the injured pelican always came first. LANCE FERRIS: And I thought, “Oh, no, what am I doing?” And I thought, This is absolutely crazy. No-one would ever believe this, for starters, and this is just madness. I looked at the pelicans in the cage and they were eating, you know, the best fish at 10 a box and I just thought, I don’t think I can do this anymore. But then I took my shoes off and plodded round in the grass under the tree and found a bowl of bush nuts, macadamia nuts. I pigged out till I just couldn’t eat another macadamia and I’m sitting there going, Yes. Yes, I’m right. I looked at the pelicans. It’s alright, fellas. Everything’s under control. MARNY BONNER: When I first met Lance he was living very, very frugally. And if he was unable to pay his electricity bill or his gas bill he would simply accept that and go scrummage around the tip or something and come out with some ingenious way of getting hot water for himself. Or he would just not eat cooked food. LANCE FERRIS: And I thought, Well, I’ve got no power. And the answering machine – it was the biggest problem, because it was the mainstay of Seabird Rescue when I wasn’t there. I had some electronic knowledge and I had a little solar panel. And I had an old battery. It worked like a dream. Nobody knew my predicament. Nobody knew how we were running the show. It still looked OK on the surface. You know, if we sort of still had some credibility – I had an answering service – Oh, well, they must be alright. You know, so it gave me a feeling of, I suppose, wellbeing. That first one, as I held it in my arms, I was awe-struck by the majesty of it. I think the immense size of the bird, no-one would realise that a pelican is as gentle as it is. MARNY BONNER: A beautiful, benign creature that doesn’t deserve the treatment that it gets. If pelicans could cry, there would be a wailing across the nation that could not be ignored. We could open a tackle shop on the hooks and line and sinkers and traces and lures that we have extracted from the pelicans we’ve caught to date, easily. LANCE FERRIS: Everyone loves Percy Pelican, and they don’t want to see anything injured irrespective of what species it is. ROCHELLE FERRIS: And pelicans were dying and, you know, no-one really counted and knew how vast the problem was. The people from one estuary don’t really communicate with the people from the next estuary what they’ve seen. In a small percentage of cases, there are people who deliberately hook pelicans. But again, it’s never an approach of accusing or retribution – always a case of education. And for him to do something about that, he needed money to do it. You know, it’s not… He was broke as it was. So he needed to get that information out there to make them aware. MARNY BONNER: Lance’s move from the dairy to the house on the same property was quite timely in a way because Seabird Rescue really required a bit more space to accommodate volunteers. But clearly there’s no point continuing to rescue birds if you don’t do something about the cause of it. How do you start re-educating millions of fisherfolk and hundreds and hundreds of waterside residents in such a way that they stay on your side, that they will work with you and not be offended? There is no room for blame or guilt or anything else. LANCE FERRIS: I had to get volunteers and I had to get public support to address the whole of the coastline, and I knew that media was the way to go. So I hammered every media outlet – television, newspaper – everything that I could get my hands into. A lot of it was rejected. Then one of the local papers said, Would you like to do a column? So I got the column going and things just took off from there. Quite often we were getting phone calls from the TV stations locally, and saying, Can we do a story on this? ROCHELLE FERRIS: After Dad’s first media exposure and the call backs he got from that, and people recognising him in the street and patting him on the back and saying, Good job, he twigged. He said, I’m onto something here, and this is going to make the difference. From that day on, every time there was a really badly injured pelican, he would be on the phone to them so quick. So this media coverage that went to all those communities was priceless in being part of the solution and making them open their eyes and, yeah, pick up their tackle. LANCE FERRIS: I could see that educating the children was really important. MARNY BONNER: Kids these days are growing up with the environmental message. Getting to the kids and educating the kids is one of the most important activities that we do. They’re the ones that will carry that message. On many an occasion we see them run off and tug on Dad’s shirt or Mum’s shirt and say, You mustn’t drop that, Mum. Mustn’t drop that, Dad. Have to pick this up now. And….the parents are kind of shamed into being more environmentally responsible than they might otherwise have been. ROCHELLE FERRIS: I guess when Dad started to realise that the problem was so national, he knew he needed volunteers. He couldn’t pay them – he can’t pay himself. Once word got out, it definitely made a difference. There was some real dedicated people. LANCE FERRIS: The volunteers come from all walks of life. They all have their own areas of expertise, if you like. We’ve got Jenny, who’s just absolutely marvellous. She’s got a lovely, lovely rapport with the birds. MARNY BONNER: Young Sam in particular was a fairly troubled child when Lance first met him – so much so that Lance thought that he was even beyond his ability to rescue him, if you like. SAM DEVINE: I was just playing up in class, then he just started doing talks at the school about Seabird Rescue. I could talk to him and he would help me with my work… ..when I was having trouble. MARNY BONNER: He’s turned around from a child who did not want to cooperate or be involved in school work or achieve anything. SAM DEVINE: If it wasn’t for Lance I probably would be in a behavioural class. LANCE FERRIS: Anthony was a person that came up here to study science with a background of being a member of the police SWAT team. MARNY BONNER: He was a very quick learner, but more importantly, he was most definitely an action man. He’s almost a younger, more energetic Lance, if you like. It’s very important to have volunteers that won’t be too offended if we’re not always as socially adept as we ought to be. We both suffer from burnout, from exhaustion, and in so doing, Lance in particular might sometimes forget to pay attention to his manners or be as thoughtful of that person or as considerate of that person as he…as he might be. He is consumed by this calling. The unfortunate consequence of that kind of dedication is that Lance can neglect important relationships in his life. ROCHELLE FERRIS: Having Marny in Dad’s life has been his Rock of Gibraltar. And, you know, they’ve had their quarrels, and people do. If Marny wasn’t in his life – God, I would have so much on my hands. MARNY BONNER: It’s been very difficult for everyone that’s close to Lance. Even acquaintances frequently become offended, um, by his lack of presence. ROCHELLE FERRIS: I wanted to throw a tantrum and get so angry because he’d missed my birthday or he’d forgotten Mother’s Day or, you know, just everything else in his life seemed to fade out. MARNY BONNER: Those of us that are close to Lance can really joke that, you know, maybe if we pierced our ears and hung a jag hook in one and a lure in the other, he might look at us intensely and say, How are you? LANCE FERRIS: We started recording all the problems that happened to the pelicans. It was very difficult for us to convince National Parks or Fisheries or anyone in the first few years that there was a problem. ROCHELLE FERRIS: He gathered so much information over time about pelican behaviour, but he needed that notoriety from the scientific community to understand what he was talking about and for him to be able to approach them on their terms, academically. LANCE FERRIS: Marny’s got the letters after her name, so too has my daughter, being a marine biologist, and that was a blessing to me. I had the information. They basically put it together and shaped it. ROCHELLE FERRIS: It was really good for our relationship, writing that paper together, to get a bit of recognition from him from what I’d studied and learnt. And I wasn’t this little girl anymore who was wide-eyed and looking at everything he did, and I…I had something to give him. LANCE FERRIS: When the report on the impact of fishing was accepted, or when they called for more copies at NSW Fisheries, I was just overjoyed. I thought, Finally! We’re gonna have to start working fairly quickly. As fast as we catch ’em, they’re getting entangled now. RecFish Australia included some of our concepts in their code of conduct for fishermen, and NSW Fisheries handed us one of their ex-service boats. Petrol companies offered fuel for the vehicle. A telephone company offered us a mobile phone. The council offered us free ferry journey. And the Coastcare, under the Natural Heritage Trust, gave us two grants so far of 26,000, which has enabled me to get to the schools and teach the children. I look back at the road we’ve travelled and people are taking more care. Well, I mean, some fishermen who used to say, Shoot the bastards… ..come up to me in the pub and say, You owe me a beer, mate. I caught one of your bloody pelicans. And don’t tell anybody about it either. I gave him a fish too after I took the hook out. MARNY BONNER: People began to call us when they noticed other things on the beach. Well done. And so the turtles were added to the repertoire of pelicans, seabirds. LANCE FERRIS: To see trained personnel at strategic locations all around the coast of Australia – that would be the ultimate goal. In July we have to vacate the premises we’re in at the moment. We were in big trouble. It was very, very heart-warming to realise the strength of the support we got from the council. The council has offered us some land for free and also a second-hand house. It’s been a fairly hard road. I guess Marny and I will have to start really getting on really, really well together, and not fighting on occasions. MARNY BONNER: I do have grave concerns about his emotional and physical health because there is so little balance in his life. He does not take the time to rescue himself, I suppose. But I can’t live that life for him. The best thing that I can do is be his best friend. LANCE FERRIS: I couldn’t have done this without her – there’s no doubt about that – irrespective of the rocky road that we’ve been along. MARNY BONNER: He’s extremely important to me. He sets a fine example constantly of what can be achieved with patience, sheer determination, a great deal of tolerance and, above all, extraordinary compassion for creatures that can do nothing to alleviate their own suffering. CAPTION: Lance and SeaBird Rescue are currently homeless while they wait for clearance of the council owned land and rebuilding. The latest injured pelican tally is 595.